The Breezeway is an easy-to-ride, comfortable eBike perfect for afternoon rides through the park or navigating the city streets. Driven by a fun-inspiring BionX drivetrain, the lightweight easy-to-step-through aluminum frame and comfortable saddle make for a light, fun ride. 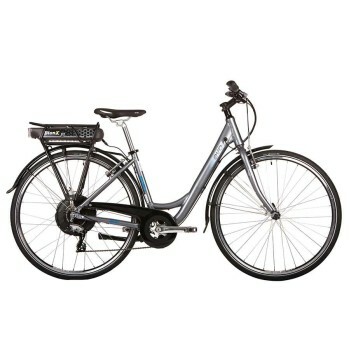 *Please note that main photo shows an optional rear rack, different chain guard, and triple crank set which is not correct. The production bike comes without a rear rack, with the 1X drive train, i.e. a single front chain ring and corresponding chain guard as shown on our own photos below.